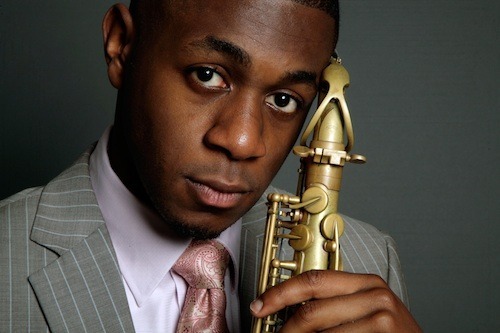 We were absolutely thrilled to hear that Tomorrow’s Warriors music leader Nathaniel Facey alongside vibist Lewis Wright were invited to join the world-class Jazz at Lincoln Center Orchestra to perform two pieces in front of a packed Barbican Centre on Wednesday 2nd July. So inspired by the whole experience, Nathaniel has already touched base today with a sea of ideas gleaned from the Lincoln Center musicians that he plans to incorporate into his regular Development Group sessions. “I learned so much, so quickly from working with the orchestra yesterday. Every musician on stage shared an absolute commitment to the music. The swing feel, the ensemble playing and the lyricism of each soloist…it was incredible to be a part of it,” he said. Nathaniel is one of our core faculty members, but also a graduate of Tomorrow’s Warriors Young Artist Development Programme. We are very proud to have helped him on his journey as an artist to this point, but equally proud to have him working with and inspiring the next generation of Warriors. If you would like to find out more about our programmes, or know a young musician who might, please check out our website. Nucleo 2014 – our best one yet!